Fires are extremely rare in caravans and motorhomes, but in the event of a fire emergency, it’s critical to know exactly what to do. The first rule of fire safety in a caravan or motorhome is simple: in the event of a fire, the first thing to do is to get everyone out as quickly as possible. Only after everyone is safely outside the caravan should you worry about tackling the fire and saving your possessions. 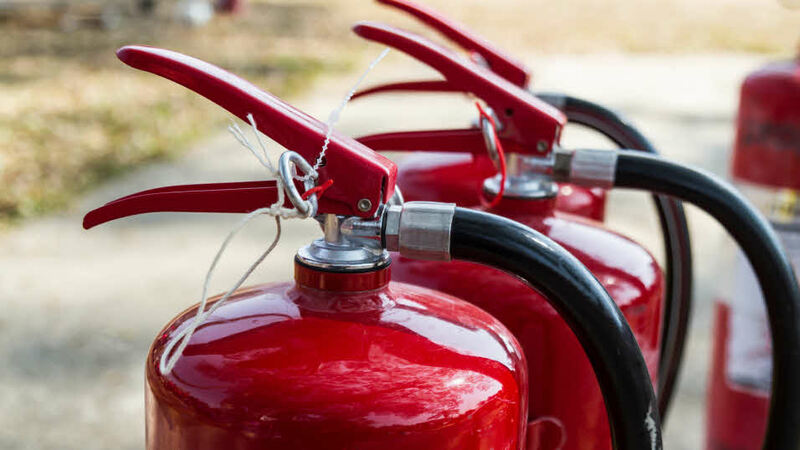 A fire extinguisher should be regarded as standard caravan safety equipment but it’s important that you carry the right type and it is positioned correctly in your caravan or motorhome. You should also know how to use it effectively. Your fire extinguisher should be manufactured in accordance with BS (EN)3 and tested and approved by the British Standards Institute (BSI) or the Loss Prevention Council Certificate Board (LPCB) or approved by the British Approvals for Fire Equipment (BAFE). A list of approved extinguisher manufacturers is available from British Approvals Fire Equipment at www.bafe.org.uk. The British Standard Code of Practice for the selection and installation of fire extinguishers is classified according to the alphabet. E.g. A=Water = Organic material, such as wood, B= Flammable Liquids = petrol and diesel etc. Although dry powder fire extinguishers are very effective in extinguishing all fires, they are not recommended for use in confined spaces such as caravans. We recommend that AFFF is the most effective for use on a caravan site. It is important that your extinguisher is checked at regular intervals in accordance with the manufacturer's instructions – although replacement is generally an easier and more economic option. The Club’s health and safety officer suggests a typical life expectancy for a caravan extinguisher of 3-5 years. Never use an extinguisher that has been discharged – even partially. The extinguisher should be located in a dedicated bracket near the door but not too close to cooking appliances, where flames could make it unreachable. Don’t attempt to use a fire extinguisher on a frying pan fire. Fire blankets are a more effective option for cooking oil/fat fires. Check they conform to BSEN 1869 and look for approval by LPC or BAFE. All new touring caravans must by law use flame-retardant foam in the upholstery and match-resistant cushion covers. If you have an older caravan, consider replacing the covers and upholstery with fire-retardant materials. All National Caravan Council (NCC) approved dealers and manufacturers must fit a smoke detector in all new and second-hand caravans - although this will not apply to privately sold caravans or those sold by dealers outside the NCC. If your caravan does not have a smoke detector, install one made to the appropriate British Standard (BS 5446 Part 1, EN 54-7) Try to fit one that has a 'hush button' which will desensitise the unit for 10-15 minutes. In the confines of a caravan, any cooking is liable to set it off and if you are frustrated into removing the battery, it defeats the object of fitting an alarm. To prevent the spread of fire on site caravans should be placed with at least six metres between caravan walls and at least three metres clear between associated equipment (eg. car, awning) and the adjacent caravan. On Caravan and Motorhome Club sites, pitches are always spaced out according to fire regulations for caravan sites but on Certificated Locations and rally fields, it is often up to you to ensure you are properly spaced. With awnings or tents around, particularly in barbecue season, it is wise to keep a full bucket of water handy outside the caravan/awning for emergencies. All caravan sites have fire risk assessments available on site. All members and visitors to site should adhere to these as instructed by the wardens. Barbecues are permitted on Club sites unless a notice to the contrary is displayed. However, do not leave barbecues unattended and make sure spent charcoal is properly cooled down before discarding. What driving licence do I need to tow a caravan or trailer?